This year many are raving about Sea Salt Spray for the beach hair look. 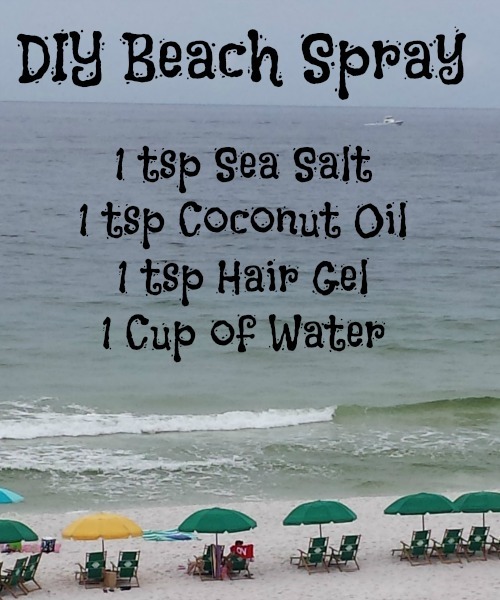 If you are dreaming about the beach and want that beach hair, here is a DIY spray for beach hair. I absolutely love it! It is so easy and actually gives you the beach look you want. 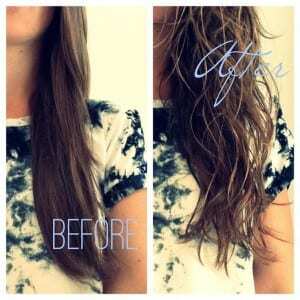 This picture from mintsprinkles.com shows the before and after use of the sea salt spray for DIY beach hair. I sometimes use Bumble and Bumble Surf Spray for my curly hair. If you have curly hair, you know the pain of finding the right kind of hair product that will keep your hair looking fabulous and also keep the frizz away. This does exactly that. When you use other hair products, they may leave your hair feeling sticky or hard; however, using a beach hair spray leaves your hair feeling light, not sticky, and frizz free. If you were to go buy this amazing spray, the price can range from $20-30. As an alternative, you can create your own DIY beach hair with a simple DIY Sea Salt Spray from Rachel Lee Clarkson. All of the ingredients for the DIY Beach Hair Spray can be found at any grocery store. An 8 fl oz. spray bottle. If you want to add a natural hair lightening element to the recipe, just add 1 tbsp of lemon juice or apple cider vinegar for natural highlights! This will give your DIY Beach Hair more color and dimension. Here are the simplest steps ever to making this DIY Sea Salt Spray!! Pour all the ingredients into the spray bottle. You may want a funnel to put the ingredients into the bottle. Spray it an wet hair and scrunch your hair. You can twirl 2 inch sections of your hair around your fingers to add definition to your hair. Enjoy your beautiful DIY beach hair wherever you are! Because my hair is naturally curly and thick, you might want to adjust the DIY beach hair recipe slightly if you have fine or straight hair. – If you have fine or oily hair, reduce the amount of coconut oil or do not use it at all. – If you do not have much curls in your hair, it will result in waves more than curls. *Note: Coconut oil is solid and will harden up at temperatures under 78 degrees. So you can microwave the spray for 15 seconds, set it out in the sun or leave it in the bathroom when you are taking a shower. This way it will melt the ingredients together. I know I am making some beach hair spray to keep my curly hair beach hair ready! Now that you see how simple this process is to make do you think you’ll make your own sea salt spray for your DIY beach hair? This would be fun to try! I love how my hair looks after a day at the beach! We will be vacationing next year at the beach, so I might try this to see what it does! That’s so cool! You have literally bottled beach hair. This is awesome! I can’t wait to try this! I love that beach hair look so much. My daughter has long hair that has a natural curl to it. I bet this would be great for her! I always wanted the beach look. I wondered how they did that. Ill have to try it. I have curly thick hair too. 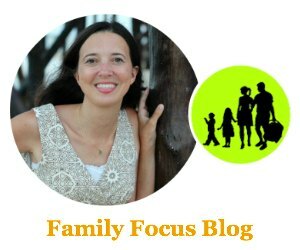 If this works so well for you, I’m sure it will for me! I love this look. I wonder if the curls will hold in my hair! I have been looking for a recipe for this stuff! It is my favorite!